Over on the SDRplay forums member RSP2user has posted a new tutorial, this time showing how to receive weather satellite images from GOES satellites with an RSP2 and cheap 2.4 GHz WiFi grid antenna. GOES 15/16/17 are geosynchronous weather satellites that beam back high resolution weather images and data. In particular they send beautiful high resolution 'full disk' images which show one side of the entire earth. As the satellites are in geosynchronous orbit, they are quite a bit further away from the earth. So compared to the more easily receivable low earth orbit satellites such as the NOAA APT and Meteor M2 LRPT satellites, a dish antenna, good LNA and possibly a filter is required to receive them. However fortunately, as they are in a geosynchronous orbit, the satellite is in the same position in the sky all the time, so no tracking hardware is required. 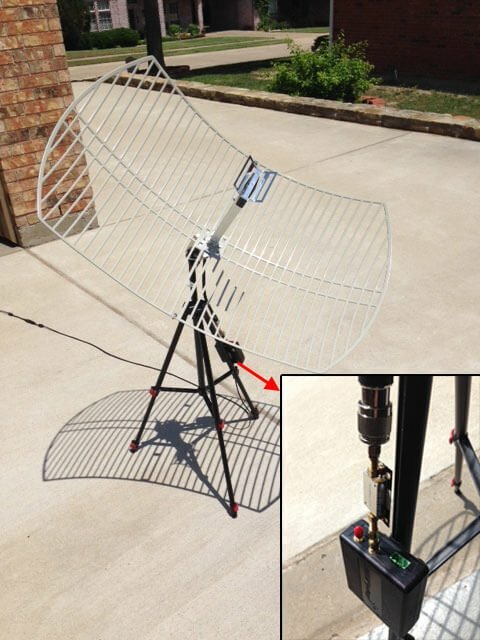 In the tutorial RSP2user notes that he's been using a $16 2.4 GHz WiFi grid dish antenna and the NooElec SAWbird LNA. In the past we've also seen GOES reception from Pieter Noordhuis who used a 1.9 GHz grid antenna from L-Com which seems to be a better match to the 1.7 GHz GOES frequency. However, 2.4 GHz WiFi grid antennas are much more common and therefore much cheaper. In the past there has been debate on whether or not these cheaper WiFi antennas would be good enough for GOES, so it's good to see that the cheaper option is confirmed to work, at least for the satellite elevations found in the RSP2user's part of the USA. The SAWBird is a 1.7 GHz LNA which is required to improve SNR by reducing system noise figure, and to filter any interfering out of band signals. The SAWbird is currently not available for public sale, but NooElec have noted that it is due to be released soon. RSP2user also notes that the polarization of the dish is important, so the dish may need to be rotated, and also that flipping the secondary reflector significantly increases the gain at 1.69 GHz. For software the XRIT demodulator from USA-Satcom for a small fee is used together with the SDRplay RSP2. As seen by Pieter Noordhuis' results, it's also possible to receive these signals with an RTL-SDR and Pieters free software. So it may be possible to reduce the costs of a GOES reception system by using an RTL-SDR, SAWBird and 2.4 GHZ WiFi grid antenna. With those components the total cost would be well under $100. As a bonus, in later posts on his forum thread, RSP2user shows that the system can also be used to receive HRPT images from the low earth orbit NOAA 19 satellite by hand tracking the antenna as the satellite passes over. Hey, Is there any reson for the rotation of your antenna or is that just so it does not fall over? Also if you hook up your SDR to a raspberry pi and run spyserver you can connect to it with SDR# over your home network or you can port forward port 5555 and connect to it anywhere in the world. The rotation angle of the grid reflector and receiving element is the skew angle relative to the vertical polarization of the satellite transmitted signal based on the actual position of the receiver on the Earth’s surface. You can use the online application at http://www.dishpointer.com to find the position of the GOES satellite relative to your position on the Earth as well as the skew angle for the rotation of the antenna. There is no skew angle. GOES is circularly polarized. He’s taking a -3db hit with that design, not accounting for the frequency mismatch, which makes it worse. It’s great that it works though! Just bought all my stuff, including a very veeeeeery cheap 2.4 ghz antenna, I got it for 13USD. I hope it works!!!! Not yet, Im waiting for my Sawbird and Nooelec SDR Dongle, I will let you know!!! I just got one for €30 delivered home. I’m going to try receiving METEOSAT-11, it’s the European variant to GOES. Uses same frequencies. So how did your project end up? This is awesome! I was waiting to see the thought emporium video to see if they can receive goes satellite with their wifi grid antenna, they probably will because they are using the same antenna (or a very simillar one). Now that I know it works, It’s on my “cool stuff to do in the future” list. Good news! Great!